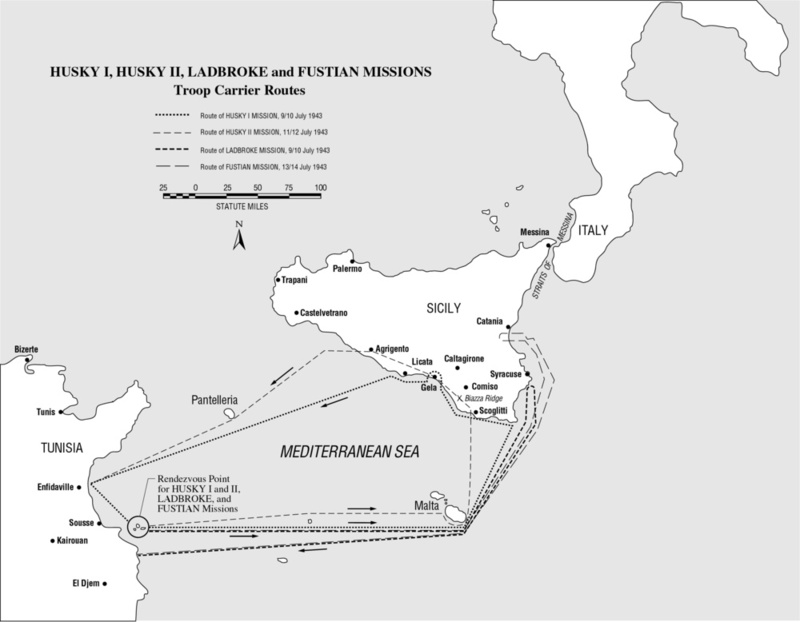 Operation Husky was one of two operations in the airborne invasion of Sicily on 9-12 July 1943. The first part (Husky I) starts with a 61st Troop Carrier Squadron flight from Kairouan, North Africa and ends with its crew on a US Navy LCI (Landing Craft Infantry) that joined others in shooting down 23 American C-47s during Husky II. The C-47s were mistakenly identified as German bombers. This has been officially documented as “Friendly Fire.” The overall story has already been published in books like BLUE ON BLUE…A History of Friendly Fire, by Geoffrey Regan, and it is the one event that stands out above most others in this operation. 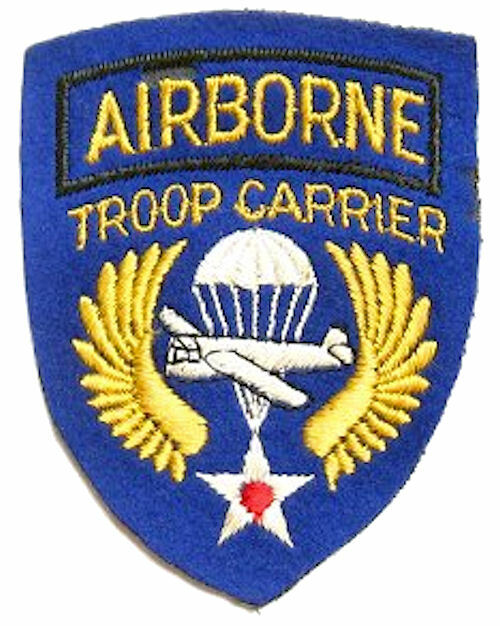 The 61st Troop Carrier squadron was attached to the 314th Troop Carrier Group, which departed from Kairouan over the Kuriate Islands, east to skirt Malta to the south, and then north to the tip of Sicily east of Scoglitti. Then they flew toward their drop zone near Gela. Their objective was Ponte Olivo airfield, and the group continued on past Scoglitti to a lake (Lago Biviero) near Gela, where it encountered anti-aircraft fire. And it is there that 2nd Lt. George Merz and his flight leader collided in the dark, which caused the loss of normal elevator control on the Merz aircraft. Those details follow later. The aircraft in both Husky I and Husky II were from the 52nd Troop Carrier Wing and are not to be confused with other aircraft and gliders directed toward Syracuse on the eastern shore of Sicily the same day. The overall history of all of this has been well-documented in several scholarly books, but as far as this recorder knows, the story told here has never been published. There were 10 paratroopers on board along with a 75mm howitzer, which was a fairly heavy piece. With the barrel, the gun carriage, the wheels, the ammunition, and its parachute, it weighed between 4000 and 5000 pounds. In addition, there were parapacks installed underneath. Merz had no idea that he would have to ditch, and he wasn’t counting on it, but he did hold a ditching rehearsal anyway before the flight left Kairouan. Sanders was to go out the top hatch and onto the wing. Crew chief Cebelak was to go back and get out the life rafts, and Merz and radio operator Yapel were to go back into the cabin and be sure that everyone left the aircraft according to plan. When the unexpected collision occurred, the damage caused severe vibration and shaking of the control column. The only vertical control left intact was with the trim tab. Merz made a 180 degree turn, banking as little as possible to maintain control, to head back out to sea. He made a very shallow left turn over the water to parallel the shore, where he ditched around midnight about 500 yards south of Scoglitti. The ditching exercise paid off and everyone got out OK. The airplane did not break up. The only damage was to elevators & rudder, and the bent propellers. The rest of the story is told in the interviews. George Merz flew the dotted line route (small dots) to Gela and back to a point 500 yards offshore from Scoglitti, where he ditched. This was in Operation Husky I. Then he watched the naval bombardment, and the landings, next day from the beach. Finally, he watched (from the deck of a ship) the U.S. Navy accidentally shoot down 23 American C-47s during the flight of Husky II (the small dashed lines). GM OK, I’ll tell you exactly how it all started. Robert Trimble and his co-pilot Ernie Baer, Don Sanders and I, and Warren Egbert and his co-pilot Frank Torma made up a flight of three airplanes. We were the tail end Charlie flight in our serial. Trimble was the flight leader, and I was on his left wing and Warren Egbert was on his right wing. We took off with the formation and we stayed in line around Malta and on up to Sicily. On the way over, it was still daylight, and the number two airplane (Egbert) all of a sudden peeled off and went back towards Africa. The reason he gave later was that Trimble almost ran him into airplanes from the 50th Troop Carrier Squadron several times, and that he couldn’t hold his position under those circumstances. He said he was afraid of a midair collision. Sanders and I stayed with Trimble and Baer all the way, and by the time we got to the Sicily coast, it was dark. We could see the formation lights of all the airplanes ahead of us. Col. Clayton Stiles was leading the serial for this initial invasion—Husky l. We could see flashes up ahead from the pre-invasion bombings by medium bombers—and I think also, B-17’s—that were plastering the area. The flight plan was to follow the coast, and then turn right at our IP (Initial Point). When we got close to that area, Trimble didn’t follow the rest of the formation—but since he was my flight leader, I followed him. The two of us passed over the main checkpoint for the IP (Initial Point), which was Lago Biviero. Our objective was Ponte Olivo airfield, which was in about 10 kilometers ahead. We could see it because it was lit up by fire. GM As we left the lake (Lago Biviero) and moved inland, anti-aircraft fire came up at us, and all of a sudden, the blue formation lights on the top of Trimble’s airplane went out. Neither Don nor I could see him—so I said, “Don, keep your eyes open for him.” We had given our paratroopers the red light to hook up as we passed the IP (Initial Point), and we were down to about 400 feet. All of a sudden, Don said, “Ah, there he is,” and Boom, we immediately felt a jolt. I didn’t have a chance to do anything. The airplane started to vibrate, and it pitched slightly down into a shallow descent. I pulled back on the control column, but we were still slowly going down. I wasn’t going to do any violent maneuvers so I put us into a gentle bank and eased around back over hills toward the water. We were low, and while all of this was going on, I tried rolling the trim tab back. Fortunately, this worked to check the shallow descent, so with power and aileron control, we turned parallel to the shore, and set things up for a water landing. I knew we were badly damaged, so I just worked that trim tab and kept us up until we were ready to go in for the landing. We were flying east, so that’s why I think we came in close to Scoglitti. When we were ready to ditch, I asked for landing lights so I could see the water—because without the lights I couldn’t see anything down there. Black, Black, Black. Then I called for half-flaps—and just as we got down close to the water, I hit the master switch to cut off both engines, and we glided in. I had gotten used to the dark by the time we landed, and that helped me judge how high we were over those breakers. GM Yeah, yeah. It was kind of rough, but there wasn’t much out there. Later when I was in air rescue, I learned all about that stuff. I would say, it was probably equivalent to a 4 or 5-foot chop. But then we eased in, and one paratrooper came crashing through to the cockpit. The airplane settled—slightly nose low—so the door in the back was fairly high above the water. Don had told everyone to prepare for ditching, and none of us had any time to fool around. I looked back to see if everybody was OK. This was it, you know. Just like when I got shot down in Holland later. You can’t hesitate—you’ve got to make up your mind. That airplane was going into the water, and in Holland I made up my mind to get that airplane onto the ground in one piece as fast as I could. Anyway, the ditching here was smooth; it was one of my better landings. What probably happened was that the parapacks hanging down there dug in and caused the nose to go in. They were an extra drag on the bottom. LJ You didn’t think of those? GM I knew they were there. Sure, I thought of them. That’s why I was easing it in, and it worked. They probably helped to decelerate the aircraft, and I think if I had a choice of landing with parapacks, or not, in a ditching situation, I would choose to dump them. LJ Dumping them would be the obvious thing, but you had your hands pretty full. GM Oh, I think I dumped the load; I’m talking about the racks. We didn’t have the British racks that leave you clean under there like a bomb rack. Ours had a big round nose on the front of them, and that was a drag. I hit the switches to release the parpacks, but I’m not sure they came off. I dumped whatever weight we could get rid of. LJ I’m just curious because sometimes one doesn’t think of everything in a situation like that. And I just wondered if you considered that. Sounds like you did. GM Hey, I knew that howitzer and all that stuff was back there. Don believes we had two howitzers, and that they were pushed into the water after landing. I don’t buy that, because we would have had them up front in our laps. LJ So what do you think happened to them? GM They went out—dumped. The paratroopers threw them out when I told Don to tell them to prepare for ditching. GM They knew we were going down. Not only that, those guys would have been mangled by them. We got rid of those before we landed. LJ Anyway, you landed in the water, and the troopers were still there. GM We got in the water and Don did what he was supposed to—he went out the top hatch. And I went to the back after this one guy pulled himself off the control console. He was OK, other than a banged up nose. So I went back to these guys. They were all in a mess trying to get their parachutes off. A big job—the best way to put it. So I had to make my way to the back. Cebelak was supposed to grab the first life raft and throw it out, and he didn’t do that. He was standing there, not sure of what to do. I think now that he was probably confused by the shock of things, and so I pulled it out of the bag, which was hard. It wasn’t all that big, but big enough. I pushed the raft out the door and held its tie rope, and told Cebelak to get in. A couple of other guys got in too, and the raft started to drift away. I remember yelling at him to get back and don’t get away from the airplane. He was supposed to get Don off the wing, because that was part of our ditching procedure, and we followed the ditching procedure, except that Cebelak was a little dazed. Then I got the second raft out, and I got several guys into it. I got them all out of there. Like Don said, I may have gotten ten men into the second craft. Everything happens so fast. When everybody was out, I told them I wanted to go back and get my submachine gun. The guys laughed and they were waiting for me, so I went back. I got one submachine gun. I got the one on the left, which is the one I had. The other one was Don’s. I didn’t get it, but I tried to get the ammunition and I dropped it because the nose was starting to go down a little bit more, and the water was over my ankles. I dropped it and ran back to the door. The raft must have been about eight or ten feet away, and the door was about four feet above the water. I pulled the lanyards on my Mae West and jumped in the water and headed for the raft to grab it. My head went under momentarily and I was flailing away until one of the paratroopers grabbed my hand and pulled me in. That’s when I saw that my Mae West (life jacket) was as flat as flat can be, and it took me a minute to figure that out. LJ Are you going to tell me that the emergency tubes to blow them up were open? GM That’s right; they were not closed, so the carbon dioxide just went shoosh. Anyway, when I got in, we got the two rafts together, and put seven men in each raft. I remember asking the guys to row around to the back. I wanted to see what happened to the airplane. I wanted to see the tail. LJ Please describe what you saw. GM The right elevator was gone. GM Almost, there was no right elevator. The fuselage was mangled where it had been attached, but it was gone. The lower half of the rudder control surface was gone. The left elevator was still there, and that’s what saved us. The trim tab was in that part. The main control cable must have been severed, but the trim tab worked. And Oh, I forgot to tell you that just before I dropped into the water from the door, Don yells at me, “Hey George, you bent the propellers.” Honest, that’s exactly what he said. LJ You drifted into shore? GM Yes, it was probably about midnight when we went down. That’s when we were supposed to be past the IP to make the drop, around midnight. Col. Stiles thought we might have been a little early, and maybe we were. I don’t really know since I was just Tail End Charlie following the mob. Anyway, we had the life rafts lashed together, and I’m trying to put this all in order. We watched the airplane go deeper and deeper, and all of a sudden the nose went down. Then the whole airplane just went down. I was telling Don this morning (October 2000) that (to me) was the worst part of the whole thing. I will always remember the empty feeling I had—and I’m sure the other guys had it too—watching that airplane disappear. It made us think how lucky we were to be still alive sitting in our life rafts, even with all that black water around us. LJ A bunch of outcasts. This was OK, but one guy had strong arms and he was paddling so hard that we were going in circles. I finally got them to paddle the same on both sides so we could go straight. While we’re doing all this, we were drifting in, and finally after about an hour and a half, we got to the beach. We could see rocks on our right and on our left, with this little stretch of open beach between them. Somehow we missed the rocks, but it wasn’t because of anything we did. Mother Nature really took us in. LJ The Gods were with you, George. GM As we hit the surf, everything tumbled over and we all got wet. Of course I was wet already, but we got up on the beach. We were all restless, and cold from the loss of body heat from being in the water so long, even though it was July in Sicily. After while, the staff sergeant who was the lead paratrooper came up to me, and said: “Lieutenant, you got us here. What do we do now?” That’s the way it was. And I said: “Well, I think I’ll take my crew, and go up the hill here and dig in, because at three o’clock in the morning, there’s going to be a big barrage coming in.” I knew this from our briefing. “Yes, Sir,” he said. Whatever I said, I had no problem with those paratroopers. They went along with it. So we all went up the hill into this vineyard, with all the vines and sticks. You know, a typical vineyard. There were low stonewalls perpendicular to the beach, separating the vineyards—like it might have been the divisions for family sections. We dug in, and sat up there, getting warm in the sand. It was sandy all the way up, and it was easy to scratch out a little hole. The ground was warm. And then we got our strength back because there was about an hour for us to sit in the sand, relaxing and getting over what had just happened to us. LJ Nothing like Mediterranean Beach sand. GM At three o’clock, I looked at my watch because I knew what was coming. Sure enough, at three o’clock on the nose, we could see orange flashes out over the water, and then we saw the smoke and these little blue lights coming up, like a nine plane formation. Three, three, three; the navy fired broadsides from a heavy cruiser—right on time. All nine guns, boom, boom, and then the shells came up..up..up. It looked like they were climbing up the sky, and all of a sudden they’d get to whistling. Then they’d go tchoom, and they’d go schh, schh, schh—something like that. Tchoom, then the crash, and then the ground would shake, even though they weren’t firing at our location. We just happened to be in a good spot—between Gela and Scoglitti—and the shells were flying in the area toward Gela where the 45th Infantry was coming in. The first division was also coming in there, but they were further away. This was all off to our side so we were lucky. That went on for a little while, and then it stopped. At dawn, we heard these Italians coming down the beach and they were talking loud, you know, like Italians do. Then I said “SShh.” Somebody else said, “Yeah, Sshh, that’s the enemy down there.” And here they came. They saw the life rafts, Mae Wests (life jackets), footprints, several footprints you know. They went into a huddle—and then everything was quiet talk. One of our paratroopers held a grenade, and I said, “If they come up the hill, throw it, but not unless they come up the hill”. They didn’t even try; they turned back down the beach, and that was the end of it. LJ The grenades were about the only workable weapons you had, weren’t they? GM We had guns. I had a .45 and a machine gun and Don had his .45. Some of the paratroopers had weapons, and they all had grenades strapped to their harnesses. LJ I don’t think I would trust guns that had been in the water that long. GM Already they were rusting. I found later that my .45 was pitted inside and out. GM Then we heard the humming—Landing Craft, Infantry, LST’s, LCN’s with tanks and stuff on ’em. They sounded just like a bunch of bees, and finally we could see the tops of some of the LSTs as they came in. The steady hum got louder and louder, and we sat and waited. They were landing down about a mile from where we were hiding. While we waited, we heard some guys coming toward us, talking in American talk this time, not Italian talk. We all lay down behind our side of the wall, and I waved my white handkerchief again. A Second Lieutenant was leading a squad of infantry, and I called out that we were Americans who had been shot down. Oh, OK. The next thing you know we’re all talking to each other, and suddenly, a machine gun started to fire at us, and we all hit the ground. The fire came from back in the woods, and the Lieutenant sent a couple of men crawling forward. Next, we heard an explosion or two—then they came back and said. “Clear Lieutenant,” and that was that. Then he told us they were on their way to take Vittoria, and they offered to take us along. I said, “We’d like to go along, but my job is to get my crew back so we can fly again.” He said, “OK.” The Sergeant paratrooper said, “We’ll go with the Lieutenant,” meaning me. He wasn’t going to go with those guys. Don wanted to go with them. Honest. He may deny it now, but he said, “George, let’s go with them.” You know what he’s like—adventurous. Anyway, they left, after telling us we could move down the beach toward the landing area where there would be help. It was still hilly, but the vineyards ended and we could see a shack up on one of the hills. Some other infantry guys had reached that shack, and it was on fire, but thinking we were Italians, they started shooting at us from there. They were about 100-150 yards away, and they must have been bad shots because there were 14 of us and nobody got hit. I took out my handkerchief and started waving it again. They had thought we were Italians because we had different uniforms. These guys had just arrived, and when they hit the beach, they were dressed in pressed OD uniforms and leggings, everything clean, shiny helmets with their ranks on them, their shoulder patches, their ranks on their arms for non-coms. I found out later from their Public Relations Officer that they were dressed in the uniform of the day, and their intent was to demoralize the Italians by making them believe they were facing elite troops. LJ Which unit was this? Was it an army unit? GM Yeah, the 179th Infantry Regiment of the 45th Infantry Division. LJ So you got through that all right. GM Not exactly. Right after that happened, two jeeps came down the beach toward us. There were coils of barbed wire that the Italians or Germans had put there between the jeeps and us, and the troops were climbing out of their jeeps to capture us. There was a Master Sergeant in charge and he had a Thompson submachine gun, and I had a Thompson submachine gun. We were talking across the barbed wire, and I told the sergeant that we were Americans who were shot down, and that these were paratroopers, and I pulled out my dog tags and convinced him we were for real. Then he showed us an opening in the wire for us to go through. We walked down that beach, and later a Duck landing craft came in there, over what turned out to be an anti-tank minefield. We had been lucky, and the jeeps had been lucky too. A little later we saw another Duck drive through the same section, and it blew up. Later we found out what those anti-tank mines looked like. They were big, like big plates, and they were buried in the sand, so I guess the Italians were anticipating something. There’s more. Our ten paratroopers went in with one the infantry companies, and they survived. In fact, about two months later, Sanders and I were walking out to our airplane to go to Salerno on a mission to reinforce the beach, and one of the paratroopers loading on the next plane yelled; “Hey, there are the guys who put us in the water.” I don’t know if they were all there, but some of them were. That was in September and a big surprise. I was glad to hear from them. Of course, I wondered what had happened to them. They spotted us, and then they were gone. LJ Another thing I’m not sure of George is your story about being on a ship where they ordered you off the bridge. I’m not sure that’s on the 2nd tape. Please tell me a little bit about that. What kind of ship was it? GM The beach master finally got us onto an LCI (Landing Craft Infantry), after it had landed its troops. I think the number was LCI 137, but I’m not sure. Their job then was to keep the beaches clear, and they were towing abandoned landing craft that were cluttering up the beach into deep water and sinking them. Then on Sunday night, D+2, the reserve paratroopers from the 82nd Division were scheduled to arrive from Africa by air. LJ Was this Husky II? GM Husky II, yes. And oh, about 11 o’clock I would estimate, it was pretty dark, the Germans were attacking. They dropped magnesium flares and a string of bombs and sank about three vessels. I’m not sure just what they were. An LST, and a LCT, and something else. Anyway they hit a couple of small ships—and then the beach master told everybody that enemy paratroopers were dropping behind our lines. I remember that, and Don remembers that too. Then about 15 minutes later, here came these planes at low altitude. Someone started shooting first, and then everybody started shooting. No one seemed to recognize them as C-47s. LJ This, I remember followed some German bombing raids. GM It followed by about fifteen minutes or so. The raiders were JU-88’s, a twin-engine bomber with a silhouette similar to C-47—so almost everyone started shooting at our airplanes. A couple went over, white stars in plain sight. One ditched behind us, and then I saw the one Don was talking about turn on his recognition lights and his running lights, and down he went right into the water, close to our ship. And I went up to the bridge and told the captain, “Hey, you’re shooting down our airplanes” and he ordered me off the bridge. The next morning, the engineering officer came down from the bridge and told me they had an apology to deliver to me, and I assumed he was speaking for the crew and for the navy. He said, “We shot down some of our airplanes last night.” and he asked me to come on deck with him. And I went up on deck and showed me. There were C-47 tails sticking up out of the water between our ship where we were anchored, and the beach. LJ Did you get his name, or any other names? GM His name was Ensign Buick. That was easy to remember, and the only one I can remember. LJ It’d be interesting to track down what happened to Ensign Buick. You know, it would. GM Yeah, I’m going to try it. And then, he was the only one who had the guts. The captain never spoke to me again. And we stayed on that ship for almost a week. In the meantime, we went out to deep water to get supplies from a support ship. We also went into Scoglitti one time and anchored. We went to an Italian supply shack where they had ammunition and Italian carbines that were poorly made, and those anti-tank mines. That’s where I saw them, and that’s where I saw this young Sergeant who was sitting on the ground outside crying. I struck up a conversation with him, he told me he was back there when the fratricide was going on and they thought our paratroopers were enemy paratroopers—and infantry and paratroopers were shooting at each other. He was a squad leader, and when a paratrooper came down on top of him, one of his riflemen shot him. He ran over to this man and he put his arms around him, and he died in his arms. He was a medical officer Captain, and the sergeant said he wanted nothing more to do with the war. LJ How did you get back to Africa? GM On the ship, the LCI. They were ordered back to Africa and we stayed with them. In the meantime, we picked up two other pilots, an A-36 pilot whose name was Dave Eichelberger, and George Bolling, a P-40 Pilot from the 99 Pursuit Squadron, one of the Tuskegee airmen commanded by Col. Benjamin Davis. They were both shot down and sitting out there in dinghies when our ship picked them up. Then we went on back to Tunis and anchored with a bunch of other LCIs. There must have been 25 of them, all in a row—and when we went off with the naval officers, we had to walk from one LCI across a little boardwalk to the next LCI, on so on. And every time we went from one to the other, we had to salute the stern, you know. You know how the Navy is. We finally got off, and the Naval Officers ordered a command car, to take us to the Operations Office at the airport. As we walked in, who should come walking out but 61st TCS pilots Gene Doversberger and A. K. Rasmussen. Talk about timing, they came out to take off just as we got there. They were, of course, surprised to see us, and the other two guys with us. We had an automatic ride home, and Rasmussen immediately agreed to take the other two pilots wherever they wanted to go. We all piled into the airplane and went first to A-36 airfield and dropped Eichelberger off, and all of his buddies came running over for a royal welcome. Then we flew to the 99th Pursuit Squadron airfield, and when Bolling came out of our airplane, the same thing—all these black Americans doing their jobs and welcoming him back. They almost carried him away, and that was nice to see. I think he must be pretty well known in the Tuskegee Airmen because I once saw his picture in the Smithsonian. And finally, we landed at our own base for our own welcome home. LJ You told me earlier about the Navy bi-plane. I thought that was right out of WW I.
GM All right, let me mention that. While we were lying out on the beach watching all the activities, and after we made contact with the 179th Regiment, their PRO (Public Relations Office) Lieutenant kind of took us under his wing. He looked after us and got us K-Rations, and got us cleaning equipment so we could clean our guns. And when our paratroopers decided to leave, one of them asked me if he could have my Thompson submachine gun, and I gave it to him. I thought he could use it better than I could. Then we’re watching some odd seaplanes—bi-plane seaplanes with a pilot up front and an observer / gunner in the rear cockpit. They had been catapulted off heavy cruisers out there—and when they returned to the ship and landed in the water nearby, they taxied up beside the ship and were hoisted onto the hangar deck. In this invasion, they were flying up and down the beaches to spot the fire for the naval guns. If there were any particular places where artillery support was need, they would identify the targets and direct the fire. All day long they had been going back and forth while I lazed in the warm sand, looking up at the sky. And while I was lying there, I saw a little blue airplane way up high, and he was coming down fast. All of a sudden, I realized he was heading for one of those little biplanes, and as I watched him all the way down, I saw the tracers come out of his gun. They fire 20 millimeters from those ME-109’s, and I could see the tracers going right into the little plane. It went into a steep spiral right into the water and crashed right behind some of the ships that were up close to the beach. Big splash. Nobody fired a shot. And that 109 just went up and rolled and disappeared. LJ That’s a story in itself. GM Like I said, he was one cocky German pilot, and he took that chance—and nobody did anything. Later we shot our own planes down, but we didn’t get this guy. He did it so fast that no one had a chance. LJ Will you repeat again your speculation that you and Don were the first Americans to come ashore from the sea in this operation—assuming that Sicily is part of Europe. GM Well, Don suggested that we were the “point men,” so to speak, of the first full scale invasion of Europe from the sea that the US was engaged in. Sicily is part of Europe proper, even though it is separated from Italy by the Straits of Messina. He still contends we were probably the first Americans to land in Europe in WW II, as part of the large scale seaborne assault—and he may very well be right. LJ That’s interesting. Am I correct in thinking you were the only crew from the 61st TCS that went down on this mission? GM Yes. Col. Stiles, who was flying a 62nd TCS airplane, also ditched, but he was picked up by a ship. In addition, John Stiles (no relation) from the 50th squadron was shot down and killed—and Clint Green of the 32nd squadron was also shot down and killed. Both their crews were also wiped out. Two nights later, two 61st squadron airplanes and two 62nd squadron airplanes were shot down by the U S Navy. One 61st crew (Funk) was wiped out, and the other three ditched and were picked up by U S Navy ships. LJ Much of this appears in the 314th casualty orders that you gave me. I think it is remarkable that you have kept all the copies of all those orders you have. I hope they can be preserved somewhere. LJ Thanks for all that information. It’s now on my edited 314th casualty report. GM You do have that? LJ I do. You helped a lot with that. GM And I think you’ll find that in those orders I gave you outlining the casualties of Sicily. That was all Husky I that I talked about. You know about Husky II; you know who all those casualties were. Sanders and I witnessed Husky II from the ship. LJ George, you know how much I appreciate your spending the time to dictate all of this. You have told me parts of it before, but this is the first time I have been able to put it all together. It is a remarkable tale. GM That should help Jan Boss and his archives. This is history; he’s getting the straight story. LJ Well, more and more people today are saying, “Try to get people to tell their stories. Don’t let them just sit there. Try to collect the stories from the survivors while they’re still alive.” You hear this everywhere. GM Because we’re fast disappearing. Stories like these will soon be lost. And I have just one more thing to report that I forgot. The night before we left Kairouan, we listened to a woman we called Midge on the German propaganda radio. She rattled off the names of the commanders of the 82nd Airborne Division that we were going to drop the next day. That was indeed disconcerting. Is there any roster that exists for the 61st Troop Carrier Group, at least those aircraft and crew shot down, for Husky 2? The official records for the 61st went to the bottom of the Mediterranean on 03 SEP 1943 when a pilot (Queale) carrying all records decided to fly low at wave-top level and chase a seabird. The aircraft went in – the records – all of them – went down. Most all of the 61st TCG records thereafter begin on 04 SEP 1943. Specifically I am tying to find out about one crew member James C. Petit de Mange, whom I thought was in the 53rd Troop Carrier Squadron.